THERESA May keeps offering her ‘Withdrawal Agreement’ as the only option except ‘no Brexit’. In fact, her proposed WA is for indefinite transition, because it gives the EU a veto on when the WA ends. The WA makes Britain’s negotiating position worse because it gives up member rights without giving up any obligations. It also commits Northern Ireland to staying in the EU even if the rest of Britain leaves the customs union or single market (the EU’s so-called backstop). If the WA ever ends, it would probably be as ‘Brexit in name only’ (BRINO). Thus, perversely, May’s warning against ‘no Brexit’ is a warning against rejection of BRINO. Such rejection would default to separation from the EU on 29 March with or without a ‘deal’. In other words, what she is trying to warn us against as ‘no Brexit’ would actually result in Brexit. So whenever May warns against ‘no Brexit’, Brexiteers should call her bluff and pursue what she warns against. To understand how May gets to the absurd position of spinning BRINO as Brexit, and Brexit as no Brexit, we need a brief review of the three years of betrayal and spin that incrementally turned black into white. Ahead of the referendum in June 2016, David Cameron promised to leave the EU on the day after a vote to leave. Brexiteers generally campaigned to replace membership with a free trade agreement, and Cameron’s replacement (Theresa May) did the same. Brexiteers noted that if the EU cut off its nose to spite its face (by refusing a free trade agreement with a state to which it is a net exporter) we could trade under WTO (World Trade Organisation) rules. WTO rules would be reversion to normal, and would conform to Britain’s trade with most of the rest of the world, which accounts for most of Britain’s trade, and is growing. Nobody expected that the referendum would be followed by eight months of procrastination before May applied to leave (March 2017). After eight months of procrastination, nobody expected May would have no policy for how to leave. Nobody expected May to acquiesce unnecessarily in an arbitrary 24-month clock to nominal leaving (29 March 2019), but still have nothing but BRINO to offer at the end. During the interval, May abandoned her free trade policy. On September 2017, in Florence, she requested a transition period of about two years to follow nominal separation at the end of March 2019, pledged to pay an unspecified and unnecessary fee without demanding anything in return, guaranteed EU citizen rights without demanding reciprocity, and ‘unconditionally committed’ to European security, which entailed – in surrounding months – British commitments to most of the agencies and programmes that make up the EU’s defence and security integration. In December 2017, she rushed to Brussels to pledge at least £39billion in response to the EU’s moaning that Britain’s demands were under-specified. She also guaranteed EU residents their rights under EU law (without demanding British rights for British residents of the EU), aligned Northern Ireland with all EU principles, and pledged no ‘hard border’ with Ireland, even though Britain has never had a hard border with Ireland, and nobody had any plans for one (the scare was invented by Ireland and the EU as a negotiating tactic). In June 2018, at Chequers, she revealed to her ignorant cabinet a proposal to stay in the single market for goods and foods, to collect EU customs on trade with the EU, to align consumer and employment rights, and thence to be subject to EU jurisdiction on all these alignments. 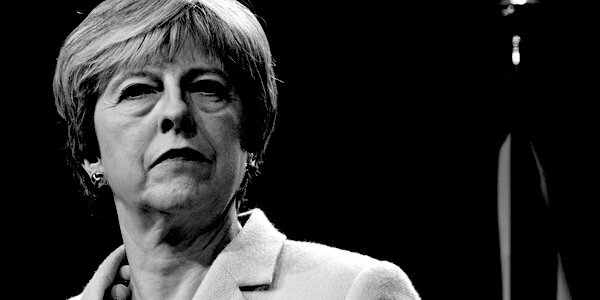 Her claims to reach trade deals unaligned with the EU, to take control of borders, to end European jurisdiction, to grow the economy, etc, were all impossible, given those alignments. As Brexiteers abandoned her government, she reached a secret agreement with the EU in favour of an indefinite transition period (which at the time I called ‘purgatory’) with all the same obligations but without member’s rights, through at least 2020, and indefinitely, because the EU can veto when it ends. Since May revealed her hated WA in November, she has offered a false choice between it and no Brexit and refused to try for a better deal – such as a free trade agreement. The lady doth protest too much. She and the EU stuck to their line for four months, but two weeks ago they addended her WA. She said that she had negotiated the right to withdraw unilaterally from the WA, but the addendum actually confirmed the EU’s veto and jurisdiction. Last week May motioned to extend the expiration of the Article 50 clock for three months (from 29 March to 30 June) in order to get her WA approved – third time lucky. Parliament is so terrified of the false no deal/cliff-edge/crashing out scenario that it voted against leaving without a deal, voted to approve her motion to extend by three months, and incidentally approved her motion for ‘indefinite extension’ if her WA were to be rejected. On Wednesday this week, May petitioned the EU for an extension through 30 June, on the grounds of getting her WA approved. The same day, Donald Tusk (President of the European Council) made approval of such a delay conditional on getting her WA passed. Thus, at minimum May wants to stay in the EU without change for three years after the referendum. The WA would add at least two years of purgatory in a weakened state, and could last indefinitely under the EU’s veto. If her WA is not approved, Article 50 would be extended ‘indefinitely’ (the minimum period bandied about is two years), before something like the WA would kick in (for, say, two years), which takes us to seven years since the referendum, by which time surely Parliament would have killed Brexit. In other words, what May offers as a false choice between a ‘deal’ to leave the EU or ‘no Brexit’ is actually a choice between purgatory without definite end or full Brexit on 29 March as currently legislated. Thus, to get Brexit, Brexiteers need to call May’s bluff and defend current legislation, through just next week, to Friday 29 March.